Which is the way it's supposed to be. Making progress. I'm not sure to what you're referring when you say "There appears to be interlacing still". If the uneven line along his collar, that's not interlacing and might be fixed by a line darkener. If you mean the "colors outside the lines" there are chroma settings to try. You're getting the chroma from the previous or next frames in the current frames. I expect you'd get the same results even if you had StaxRip do the job. This is the best I've managed to come up with. It's simple, but removes most of the blended chroma, or whatever the cause is. I'm not quite sure I understand why it works yet, but.... make sure DGDecode is honouring pulldown flags (outputting 29.970fps). I've no idea how to add them to StaxRip. Would this work with QTGMC? 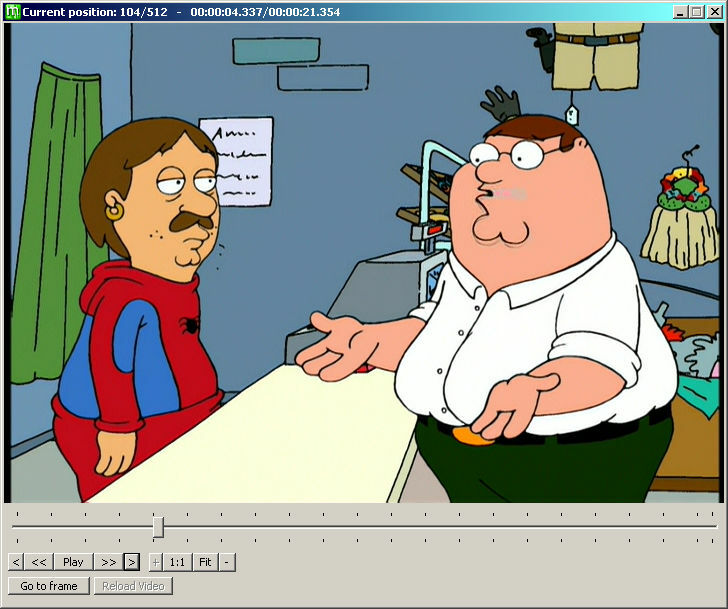 QTGMC doesn't always work well with animation, probably because it has lots of repeated frames. When I replaced TDeint with QTGMC, I found an artefact pretty quickly. See the ghosting under Peter's chin in the pic below. Plus TDeint() seems to do field matching, which is mostly what's needed here. It doesn't de-interlace unless it has to. The TDeint(mode=1) output is much like TFM(), only it repeats frames for double the frame rate. It doesn't produce jagged lines and edges as Yadif(mode=1) would. FixBlendX() works in a fixed pattern, so if there's not a fixed pattern of blending (or whatever it is) it mightn't work for the whole video and you'll have to split it into sections. You could try SRestore() instead, but I thought it was dropping frames it shouldn't in this case (Edit, that's incorrect. See the next post). Or there's AnimeIVTC(). I haven't used it much myself. Last edited by hello_hello; 24th October 2018 at 20:49. I'll take back what I said about SRestore(). 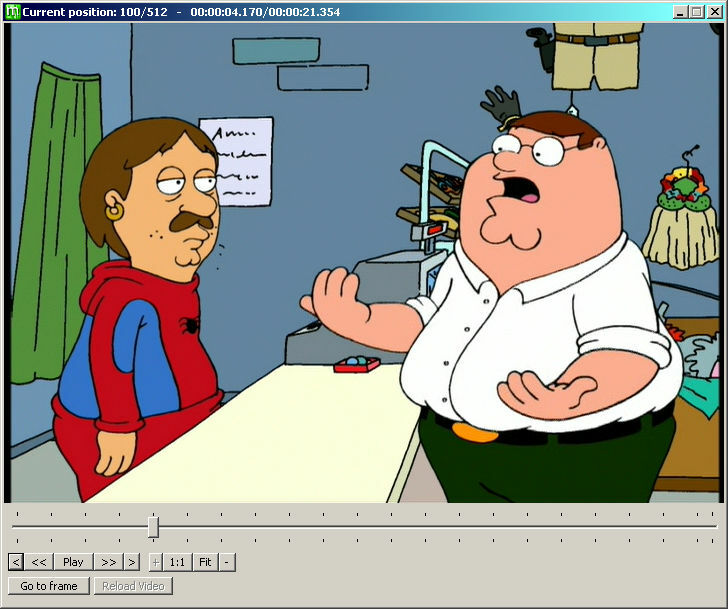 I did a side by side comparison with FixBlendX(1) and they were outputting the same frames. I obviously didn't combine SRestore with the right field matching or de-interlacing earlier. This should work just as well. Last edited by hello_hello; 24th October 2018 at 21:19. I'll take back what I said about SResore(). I did a side by side comparison with FixBlendX(1) and they were outputting the same frames. I obviously didn't combine SRestore with the right field matching or de-interlacing earlier. This should work just as well. If I ran TDeint and then QTGMC would it screw things up? Because I have "viberating" frames in the source and QTGMC seems to fix that while TDeint didn't. See if that works for you. You might be able to use a faster preset to make the encoding faster. I just used the default setting for QTGMC. QTGMC also has the added advantage of maybe fixing (or improving) the "vibrating" of which you wrote. Last edited by manono; 25th October 2018 at 00:49. Do you know why it's saying "GScriptCilp" doesn't exist? I tried to install GScript and GRunT but they are 32bit. StaxRip x86 doesn't exist. Last edited by Vitality; 25th October 2018 at 03:30. You might not want to use FPSDivisor=2 because that limits the choice of frames from which SRestore can choose. However, if you can remove that chroma nastiness doing it that way, then more power to you. But I still wouldn't do it. Scroll down a ways. Or use an older version of Srestore that doesn't require that GScript stuff (before v2.7f). Hi, I'm too looking at ripping Family Guy DVDs, I have some region 1(US) & some UK Pal versions..
What about the Pal ones, has anyone encountered those? I wonder if its harder to sort out than the US ones..
Post a sample taken from the DVD. The content is progressive. It was even encoded as progressive, unusual for PAL. They're probably better than the NTSC versions, based purely on that sample. Sorry for the long delay, ripped all the 1 5 seasons before getting any more samples.. I do also have (brother) access to the US versions. But weren't sure which was better..
Is this fairly safe for most instances here ? i.e: hard or soft blends, as form what I can tell looking through this seems there's a mixture. I don't know what "hard or soft blends" means. I've never used VapourSynth. SRestore is not "horrendously slow". QTGMC might be, but not SRestore. Only a sample will prove useful. I assume theres gonna be setting s individual to each individual episodes on some of these us versions? & Yes, probably due to setup not being right, & not knowing how to get around it, sRestore (avisynth) isnt using all CPU resource.. I'm using the Hybrid GUI & Vaporsynth is just another option. Last edited by DJ-1; 22nd January 2019 at 07:41.